Tired of your old clothes? Don't have the time, energy, or funds to plan a shopping trip? Join our clothing swap! Come in with your clean and gently used items and walk away with new-to-you clothing and accessories. 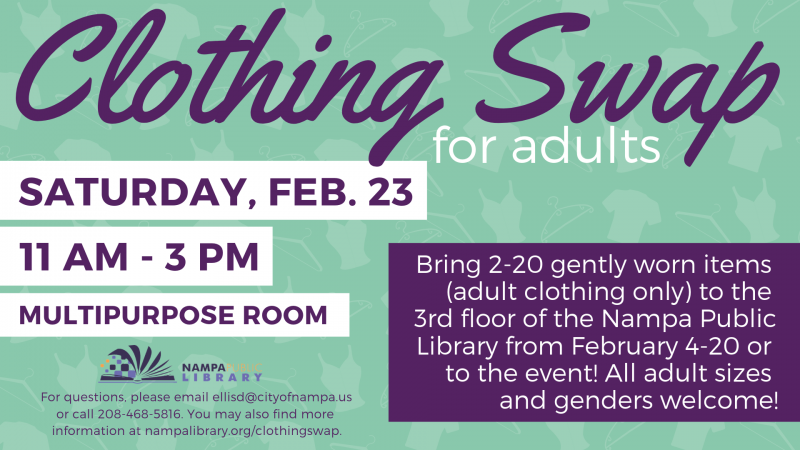 Here's how it works: drop off 2-20 gently used and clean items * (clothing, shoes, accessories) at the information desk on the 3rd floor of the Nampa Public Library any time before February 20th or bring your items with you on the day of the swap. Receive a coupon for the number of items you bring and exchange that coupon for up to the same number of new-to-you items on Saturday, February 23rd, from 11am-3pm in the library's Multipurpose Room. All sizes and genders are welcome! *This is a clothing swap for adults, so please do not bring any children's items.